For over 40 years, racers from across the globe have turned to Goodridge for products to out-perform the competition. Drivers, riders and teams have been pushing the limits with Goodridge since 1969. 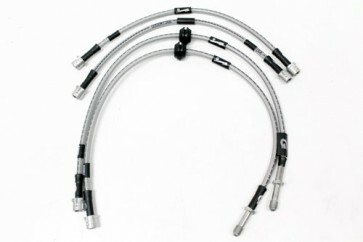 Factory fitted brake lines are usually made of rubber. Even when new, rubber expands under pressure causing a decrease in braking performance and spongy pedal feel. 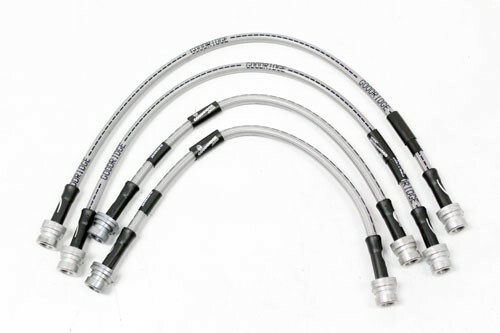 Terrafirma Goodridge brake hoses won’t expand under pressure, delivering precise braking when you need it. Every Terrafirma Goodridge brake line is individually 100% pressure tested and guaranteed to be leak free. Terrafirma Goodridge brake lines are corrosion resistant and come with a lifetime guarantee. Every brake line kit is supplied with all fixings required to provide a perfect fit first time, every time! Each hose has a PVC protective covering. OEM Specification fitting plating with 968 hour salt spray protection. UK manufactured and assembled product. 100% TUV, DOT, ADR and ISO approved. Every brake line is 100% pressure tested to 2000 PSI once fully assembled.